Nuremberg and Rothenburg ob der Tauber are both popular German destinations year-round, but they are particularly lovely towards the end of the year when the Christmas markets move into the town squares. But in between these charming towns, others are worth visiting for more of the festive fun. 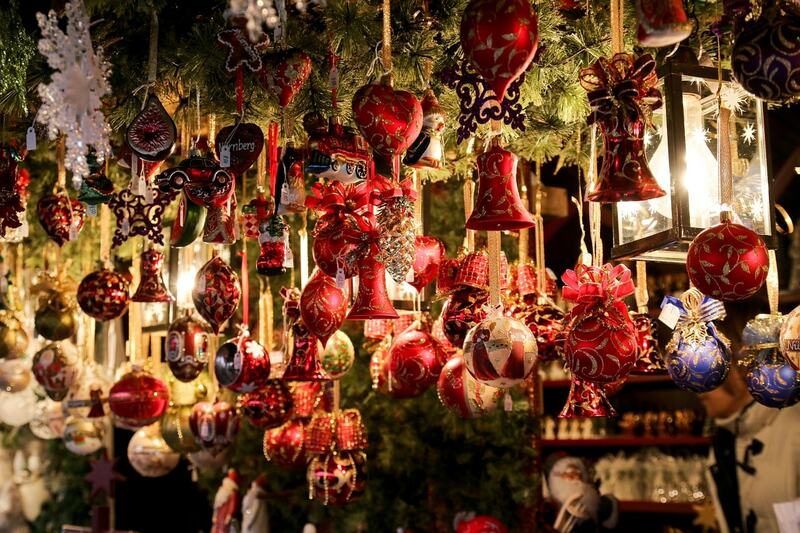 Here are seven Christmas markets in the region to put on your list. In the weeks leading up to Christmas, the medieval Frauenkirche, or Church of Our Lady, towers over one of Germany’s most famous Christmas markets. Some 180 vendors move into the red-and-white wooden huts on the festively decorated market square. If you want to buy souvenirs and gifts for the whole family, you’re in the right place – whether that’s carved wooden toys, beeswax candles or handmade leather bags and purses. The food stalls focus on regional specialities – mulled wine, Nuremberg Rostbratwurst and gingerbread are a given. The historic Christmas market aside, Nuremberg has another treat up its sleeve when it comes to Christmassy experiences. For the past ten years, an initiative has organised the Feuerzangenbowle event. The tongue-twisting name describes a hot drink of red wine and rum and spices. In a celebratory act, a sugar cone is dipped into rum, lit up and then caramelises into the brew that was made famous by a 1944 German film with star actor Heinz Rühmann. The Nuremberg event wallows in nostalgia with screenings of said film, music by Heinz Rühmann and a 9,000-litre kettle of Feuerzangenbowle. Treat it with caution; the potent drink might knock your socks off. Rothenburg ob der Tauber is considered the epitome of German villages. The picturesque cityscape of winding cobblestone alleys, half-timbered houses and the preserved medieval city walls could be straight out of a fairytale. The local Christmas shop sells tree ornaments, cards and other decorations year-round. But nearing the end of November, the town transforms into a magical festive wonderland. The Christmas market has a 500-year-long tradition and offers the best of traditional handicrafts and local sweet and savoury food. 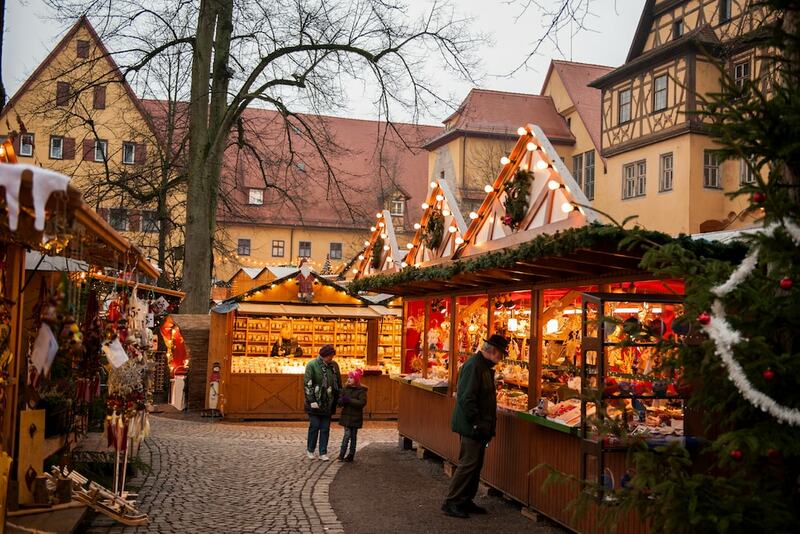 The Christmas market in Ansbach’s picturesque old town is a highlight of the festive season. Framed by the city’s two major churches and illuminated by an elaborate light concept, the event puts visitors in high spirits. Some 40 vendors offer trinkets, crafts and décor typical for the regions as well as Franconian culinary specialities, such as Ansbach bratwurst and gingerbread. Parallel to the market, several events from late night-shopping to jazz concerts and an ornamental blacksmith show take place in during the Advent season. 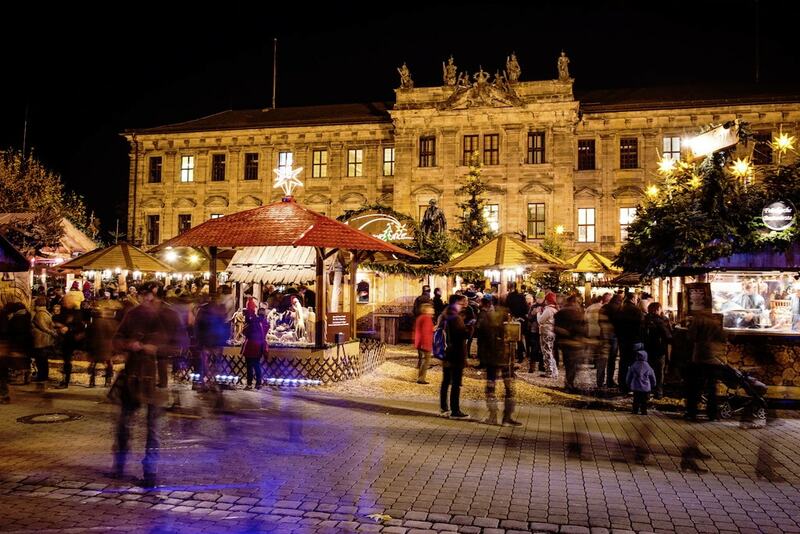 Erlangen is not exactly located between Nuremberg and Rothenberg, but being just 20 kilometres north of Nuremberg it lures with a unique Christmas market experience. The 300-year-old event got a new look a couple of years ago and has been praised for the quaint and cosy atmosphere. Now, the square in front of the Erlangen Palace transforms into a forest-like area. The place is decked out with bark and wood chips surrounded by fir trees and rustic wooden huts decorated with lights and garlands set up. Sweet and savoury food is available, as are drinks, and the vendors sell handcrafted products from children’s toys to tree ornaments. The small Christmas market in Fürth has existed for the last 30 years but is still considered an insider’s tip. The organisation of the event is a community effort, and those involved work with attention to detail. The result is a cosy Christmas village of wooden huts where artisans from the region showcase the best of their work from ceramics to glass sculptures and jewellery to wood-carved figures. Classic Christmas market food, mulled wine and a festive entertainment programme round up the experience. More medieval town bliss waits for you in Dinkelsbühl. The small town 50 kilometres south of Rothenburg puts on an annual Christmas market in the courtyard of the historic Spitalhof theatre. You’ll find vendors selling regional specialities and beautiful arts, crafts and décor. Venture out and go for a stroll around town as well. The half-timbered houses are decorated with fairy lights and evergreen garlands, and it seems that the whole town smells of roasted almonds and Glühwein.